If you are a CALS full time freshman, sophomore or junior and looking for an internship this summer (or know someone who is), check out the CALS summer internships. View more plant-science related internships at the Horticulture Internships blog. The Department of Plant Biology cordially invites all undergraduate students in the plant sciences to our annual get-together. Refreshments and good cheer with be provided between 3:30 and 5:30 PM on Friday, February 3rd in Mann Library Room 102. Please join us to meet and chat with faculty and friends. We hope that you can attend. See you on Friday. Some of the changes in the zones, however, are a result of new, more sophisticated methods for mapping zones between weather stations. These include algorithms that considered for the first time such factors as changes in elevation, nearness to large bodies of water, and position on the terrain, such as valley bottoms and ridge tops. Also, the new map used temperature data from many more stations than did the 1990 map. On Wednesday, the U.S. Department of Agriculture will unveil its long-awaited new “Plant Hardiness Zone Map” at the U.S. National Arboretum in Washington, D.C. The map – a vital tool for gardeners, farmers, researchers and policy makers – is expected to change in part to reflect changing climate patterns across the United States. David W. Wolfe is a professor of plant and soil ecology in the College of Agriculture and Life Sciences, and the chair of the Climate Change Focus Group in the Atkinson Center for a Sustainable Future. 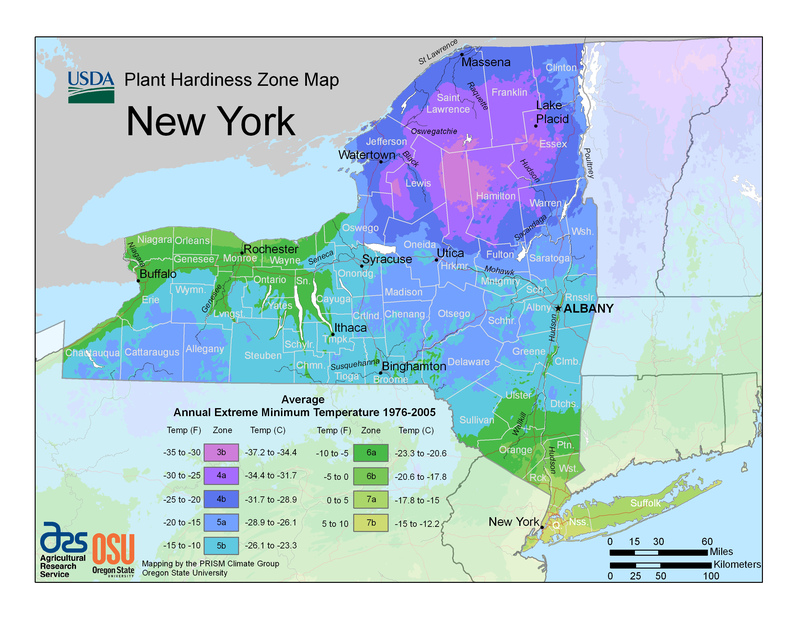 “For decades, gardeners have used Plant Hardiness Zone maps, based on minimum winter temperatures, to determine what plant species are adapted to where they live. The last version published by the USDA appeared in 1990. In 2006, the Arbor Day Foundation published an updated map using the same methodology of the USDA, which shows a dramatic ‘zone creep’ northward throughout the country. Art DeGaetano is a climatologist and professor of Earth and Atmospheric Sciences, and the director of the Cornell-based NOAA Northeast Regional Climate Center. “The northward march of the hardiness zones illustrates the continued warming that has occurred across the United States and around the globe in recent decades, particularly in winter. Projections for state-of-the-art climate models indicate that winter temperatures will continue to warm through the 21st century. Additional updates and changes to the hardiness map will be necessary in years to come. William Miller is a professor of Horticulture, and one of the world’s leading experts on floriculture and the physiology of ornamental plants. “One thing I have learned from growing plants in many locations in the U.S. is that plants can’t read! Experienced gardeners are always pushing the envelope by trying new plants, and especially those that ‘aren’t hardy’ in their area. Really crusty gardeners sometimes say that they need to kill a plant three times to be certain it won’t grow in their area. “Aside from global warming or simply more and better data leading to a more accurate map, there is always microclimate variation in any locale and a few feet alteration in planting site, better drainage, locating a plant around a corner, presence of snow cover, mulch, or protection from wind can make a huge difference in winter hardiness. MEDIA PLEASE NOTE: Professors Wolfe, DeGaetano and Miller will be available to talk with the media by conference call at 1 p.m. Wednesday, shortly after the USDA announcement. To participate, call 1-866-910-4857, passcode 858182. All three will also be available for one-on-one interviews following the announcement. For more information about the USDA announcement, contact USDA Special Projects Chief Kim Kaplan at 301-504-1637. Alan Lakso traveled to Australia in December at the invitation of the Victoria Department of Primary Industries to give research seminars and half-day workshops on fruit crop modeling. Lakso will also be giving a presentation to the Association of American Geographers national meeting in New York City ini February. In other news, Alan Taylor will speak January 25 at the U.S. Western Regional Seed Physiology Research Group workshop at the University of California-Davis. He will give four presentations ranging from seed treatments to biofuel crop seed research. Royse Peak Murphy, native of Norton, Kansas and survivor of the Dust Bowl experience, the Great Depression and World War II, joined the Cornell faculty in 1946 with a focus on plant breeding. During his long career at Cornell, Murphy released many new crop varieties, supervised graduate studies for 21 Ph.D. students and 12 Master of Science students, and served as department chair and Dean of the Faculty. Here, Murphy discusses the history the plant breeding department at Cornell with fellow plant breeder Donald Viands. He is the co-author of a book on the subject, “Evolution of Plant Breeding at Cornell University” (2007). Broaden your understanding of organic techniques for all kinds of gardens, including vegetables, fruits, flowers and ornamentals, and lawns. 8-week course starts Jan. 10, 2012. Take an in‐depth look at the web‐based tool Adapt‐N, and learn about the dynamic simulation model processes that generate the N fertilizer recommendations and other information based on field‐specific weather and management information. This half day workshop will provide an overview of soil health concepts and the Cornell Soil Health Test, the indicators it measures, and agronomically essential soil processes they represent. More program and registration information.